Poised with a dignified air, the Scottish Terrier has been bred pure since the 1800's. The Scottish Terrier, also called Aberdeen Terrier, are beloved for their charm and protectiveness. Scotties are playful as puppies, but become more sedate as adults. They become attached to their families, and they make great guard dogs. When selecting a Scottish Terrier, it is important to ask the breeder about the possibility of genetic disorders and predispositions. They are also prone to skin and jaw problems. This small terrier was originally bred as a hunter of vermin, foxes and badgers. Scottish Terriers possess a dignified air about them, and are much stronger than they look. The Scottie does best in areas with cool weather. The Scottish Terrier originated in Scotland, along with several other types of terriers. They were favorites of farmers and fox hunters, as well as King James VI. There has been some debate as to whether the Scottish Terrier is the original highland terrier breed, or if it originated from the Skye Terrier. It is known that the Scottie has been bred pure since the 1800's. Scottish Terriers come in black, wheaten, and brindle colors. They have short legs and pricked ears, with dark eyes and large noses. They are typically 10-11 inches tall and weigh 19-23 pounds. 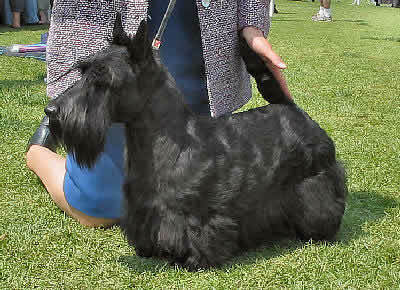 The Scottish Terrier thrives on foods high in carbohydrates and low in protein. Poultry, mutton, and wheat are good component choices. The Scottie's wiry coat needs to be brushed regularly. Baths should be given as needed, and the dog needs trimming twice a year. The breed sheds very little and is generally well behaved in the house, requiring little cleaning up after. Scotties are great indoor dogs, and they are well suited to apartment living. They are active but not overly active when inside. They do not necessarily need a yard. Scottish Terriers may be aggressive toward other dogs unless they are introduced to them while young. They like to chase other animals. They do best with adults and older children, and are generally shy around strangers. The Scottie is stubborn yet sensitive, requiring owners to be firm yet gentle in handling and training. Scottish Terriers need daily walks in addition to play time. They enjoy playing in the yard without a leash, but it is best if your yard is fenced in to keep them from running off after other animals. Scottish Terriers are often confused with West Highland White Terriers, but the true Scottish Terrier is never white. This is an important distinction in breeding. Due to the breed's predisposition to health problems, it is crucial to check into a potential mate's lineage. Scotties sometimes have difficulty whelping. Common health problems in Scottish Terriers include von Willebrand's Disease (a bleeding disorder), Cushing's Syndrome (a hormone imbalance), and epilepsy. Scottie Cramp is a hereditary disorder unique to Scottish Terriers. It causes a painful change in gait when the dog is stressed. Careful monitoring of your dog and regular veterinary checkups are essential. Scottish terriers are readily available from breeders and pet shops. Average cost for puppies ranges from $500 to $750. Tiny Teacup Pomeranian Puppies. From our family to yours. We have the best quality of tiny micro teacup Heavenly teacup Pomeranian puppies for sale. Healthy, happy and playful. pictures and info on all available puppies. Be ready to fall in LOVE! She is adorble. I have a scottish terrier to her name is Chloe and she looks just like yours when we give her a hair cut.